“Flag on the play. False start. Check back with us on 2/7/19,” with a Football referee gif signaling the false start. February 7 happens to be the first media day of the Chicago Auto Show—a show famous for truck debuts. Rumors of Ram offering a split tailgate date back to 2014 when Fiat Chrysler Automobiles filed a patent for the design. Three years later in 2017, as Ram was developing the latest generation of the pickup, spy photos emerged of prototypes featuring a split tailgate design. 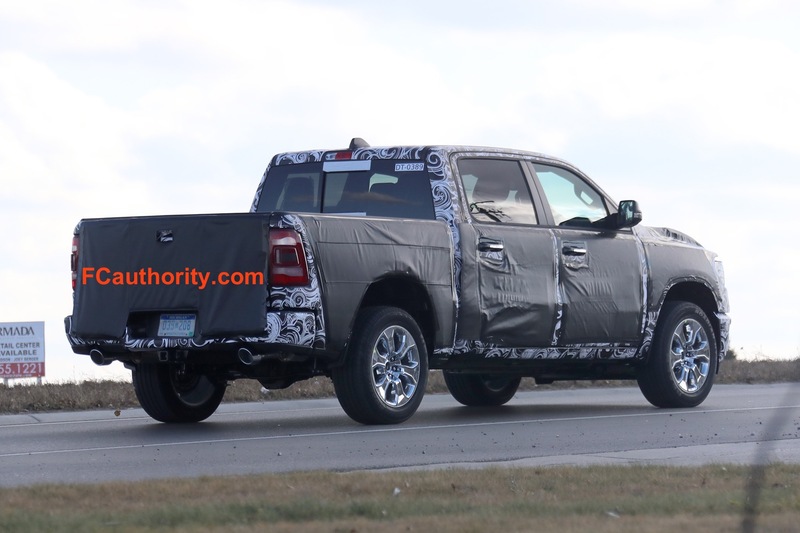 However, when Ram did unveil the all-new 2019 Ram 1500, it lacked the split tailgate design teased earlier. The latest back-and-forth on Twitter is a pretty strong indication Ram has something up its sleeve coming later this week. GMC introduced the MultiPro tailgate for the 2019 Sierra 1500, after years of chastising Ford for its integrated step in its pickup truck tailgates. GMC went far beyond anything from Ford with the six-function MultiPro tailgate. The trick tailgate is both flexible and functional, providing owners with a slew of uses the range from offering load-stop and second-tier loading solutions, a standing work station, easier access to the bed, and a step entry and egress mode that, when paired with the assist handle, functions as both a seat and a step. Thankfully, we won’t have to wait long to see what Ram will reveal as the Chicago Auto Show begins Thursday, February 7. Stay tuned for the latest from the show. Lol a split gate? I respect ram but I doubt that a split gate is going to pose any threat to a tailgate that has 6 functions. It’s supposed to have built in ramps for loading as well. I’m sure they’ll have a large touchscreen attached to it so you can open and close it too. You guys will love it then. “I’m going to seriously look at a Ram next time” – doesn’t buy large touchscreen. Never thought of owning a Denali for work and never used my tailgate as a work station, trucks get beat up when you use them for work and I would think the tailgate would get beat up if you used it as a work station. GMs rear bumper cut outs or Fords tailgate step are enough for me. I guess I long for a simpler day; an origami tailgate is the very last selling feature I’ve got to have. How about a Ridgeline style tailgate and some short pull out steps that hinge and hang down. That’d be all I need. See this is the real problem with the automotive industry! Comments like this, people who think companies need to build a car or truck just for them! Millions of people buy these trucks and they need to be designed to be able to accommodate the majority of the buyers that might be interested! The new Ram tailgate is already being leaked. It will have traditional fold down and also a split barn door type action. There will also be an optional center step. Ram is also smart enough to offer the new tailgate across all trim levels of their truck as these type of features often are most useful to the lower end work trucks. Just like the 10 spd. auto, GM forces you spend more and opt for the higher trim levels to get the special tailgate.